growing need for transparency in company valuation and the ability to assess the risks organizations are facing. After numerous rounds of input, the TCFD published a set of recommendations in June 2017 to “help firms understand what financial markets want from disclosure in order to measure and respond to climate change risks and encourage firms to align their disclosures with investors’ needs.” These recommendations focus on four core operational elements – governance, strategy, risk management and metrics, and targets. They are designed to be implemented across all sectors to varying degrees. In recognition of the breadth of climate change reporting already occurring, TCFD allows for organizations using existing disclosure frameworks to apply the TCFD guidance within that framework as they become accustomed to the more rigorous reporting requirements. Therefore, companies already reporting and disclosing information under other frameworks (e.g., CDP Climate Change) may be in a better position to implement the Task Force’s recommendations within the first year. The TCFD anticipates that reporting will evolve over time as expectations rise and quality and consistency in reporting continue to increase. Companies outside of these sectors will respond to the general CDP 2018 Climate Change questionnaire. 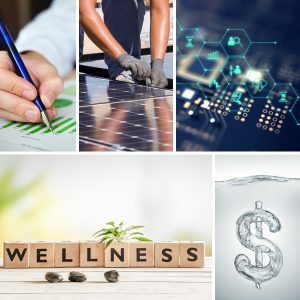 To align with the TCFD recommendations and to allow for broader reporting of sustainability metrics, CDP has added new questions to the 2018 general questionnaire and amended others. 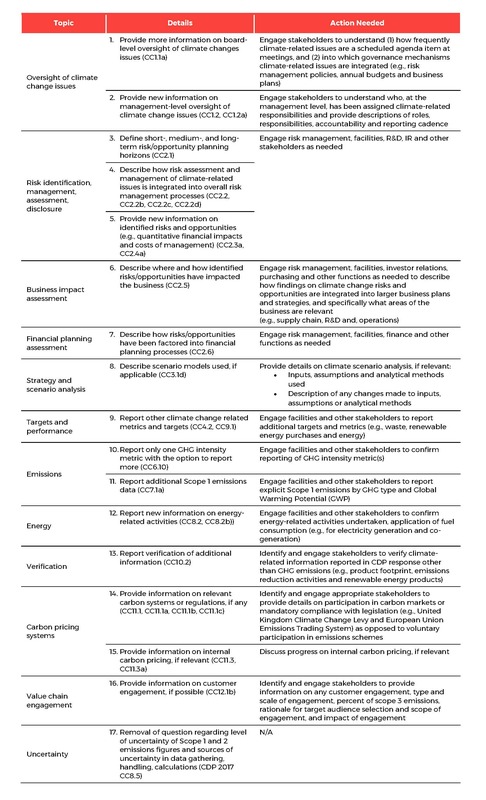 Key changes to the general climate change questionnaire are outlined in the table below. As CDP’s scoring methodology will not be released until March 2018, the scoring implications of new and amended questions are unclear at this time. CDP will also publish the detailed reporting guidance document in March, which will provide additional details on these changes. Given these changes and to enhance your organization’s understanding of climate risks and opportunities, we recommend developing a plan early in 2018 to address the TCFD recommendations and other changes in the CDP Climate Change questionnaire. This will allow your organization to continue building climate resilience, improve upon your 2018 CDP Climate Change response and other corporate disclosures, and prepare for potential internal or external requests for information on your organization’s approach to implementing the TCFD recommendations. 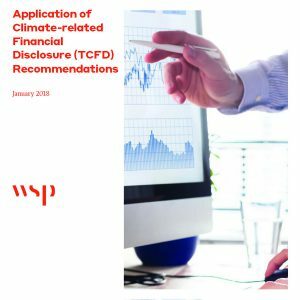 For additional information on the TCFD recommendations, download our whitepaper – Practical Considerations for Application of Climate-related Financial Disclosure (TCFD) Recommendations. Keep following our blog for guidance on how to respond to the CDP 2018 Climate Change questionnaire, including scoring information for the new and amended questions outlined above. We will be posting the whitepaper, Making the Most of CDP 2018, that will coincide with the release of the scoring methodology in March 2018. Additionally, we will be providing a summary of key changes to the CDP 2018 Water questionnaire, in an upcoming post, Key Changes to the 2018 CDP Water Questionnaire.